If you want the full SOCOM 4 experience, you're going to have to pay for it, one way or another. Zipper Interactive, the developer behind the SOCOM series, has revealed a incentive scheme to encourage people to buy a new copy of the latest game in the series, SOCOM 4: US Navy SEALs, rather than pre-owned one. This schemed is called "SOCOM Pro," and bears a rather striking resemblance to EA's project ten dollar and online pass initiatives. 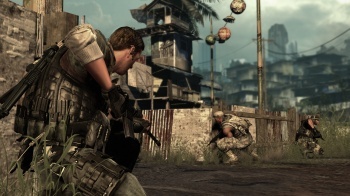 SOCOM Pro allows access to a number of custom online game queues, including several that were part of the game's beta. The games are ranked, and will be regularly updated over the course of the game's lifespan. The pass also grants access to two new weapons: the M-16 for Navy SEALs players and the AK-47 for Insurgent players. According to Zipper, these are weapons that fans have been clamoring for, and SOCOM Pro users can expect to have them within 30 days of the game's release. The studio said that the Pro members would also receive new content further down the line, like exclusive multiplayer maps, co-op options and dedicated leaderboards. Anyone who buys a new copy of the game gets all the Pro content as part of their purchase, while anyone who picks up a pre-owned copy will be able to purchase a Pro membership through PSN for $15. Unfortunately for the pre-owned players, these memberships won't be available until April 26th, a full week after the game comes out. It's hard to know if the Pro membership is worth the money, however, as so much of the content associated with it is yet to come. As it stands, a few custom game queues and a pair of new guns doesn't really sound like a must-have purchase, especially as it doesn't seem that pre-owned purchasers are actually barred from playing online. SOCOM 4: US Navy Seals - or Special Forces if you're in the PAL territories - comes out for PS3 on April 19th in North America, April 20th in Europe, and April 21st in Australia, New Zealand and the UK.